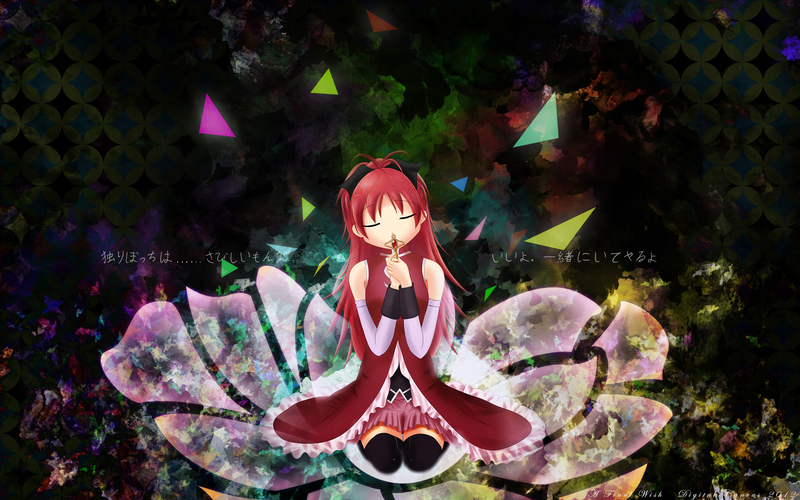 Puella Magi Madoka Magica's one of my favorite anime. Kyouko's my favorite out of the group. She and Sayaka are really cute together. Kyouko's sacrificing her life to be together with Sayaka has been really touching to me, and so I decided to portray her final moments. For the background, I decided on a grungy abstract background in the beginning. To symbolize being in an about-to-end witch's realm. The darkness closing in on her as she's making her final wish. The shards sprinkling as her soul gem's fractured. A lotus flower under her to symbolize her journal into the next world (as a lotus grows in muddy waters and rises above the water to bloom in beauty). And last but not least, Kyouko's final words: "独りぼっちは... ...さびしいもんな... いいよ。一緒にいてやるよ" (It's lonely to be alone... It's alright, I'll stay with you).